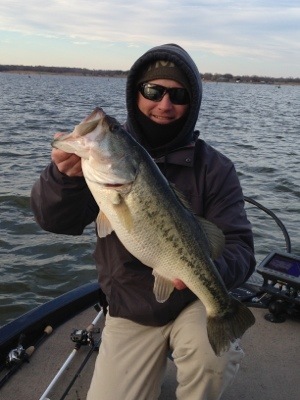 The bite has slowed down some with the water temperatures falling into the low 50s. Our water temps to start each morning have been in the 50-52 degree range, and have only warmed up to 53-54 late in the day. Water level as of this writing is 398.86 or 4.14 feet below normal pool. The water is very stained in many areas of the lake and slightly stained in others. We have some hydrilla trying to make a comeback in some areas, but it is all in less than 3 feet of water. Most of our fish this week have been caught on a 1/2 oz or 3/4 oz black and blue Santone jig, but we did catch a few on a Camo colored Santone jig. I am throwing the 3/4 oz jig along the deeper creek channels in 10-14 ft of water, and I’m switching to the 1/2 oz jig when we’re fishing less than 10 ft deep. One thing that has been a key for us is to slow WAY down. I haven’t been able to trigger them to bite by fishing the jig aggressively. We are basically having to crawl it along the bottom and banging it into any available cover. If you’re not feeling the wood, you’re probably not going to get bit. The Santone jig hangs up less than most jigs because of the shape of it’s head. Being flat on the bottom, the jig doesn’t roll over on it’s side when coming through the brush like some other jigs do. Less hang-ups equal more fishing time and better hook-ups because the hook is almost always in position to stick the fish in the top of the mouth. Once we get a bite, we are being even more thorough as there will be multiple fish in that section of creek. Sometimes, we are pitching to the same stumps 4 or 5 times before we finally get a bite. It’s not easy fishing, but it can be very rewarding. Having quality fishing line can be critical when fishing the heavy cover here. I have seen and used lots of different brands of fishing line over the years, but I’m convinced that the best I’ve ever used is Seaguar Invizx. I use 20 lb Invizx for jigs and most soft plastics, and 15 lb Invizx for crankbaits and jerkbaits. The weather over the next few days is going to be a little cooler than what we’d like to see. The highs are supposed to be in the low 50s and the lows are supposed to be in the low 30s. This isn’t going to bring our water temps up any, so the jig bite should continue to produce the best results for the big bite. If you need to get bit, you might try a shaky head in the same areas. Sometimes there are fish that won’t bite the bigger bait, but they’ll eat the finesse worm. I know I’ll be throwing it a little more this week. If you have any questions or comments, please feel free to use the comments section below. Best of luck on the water! 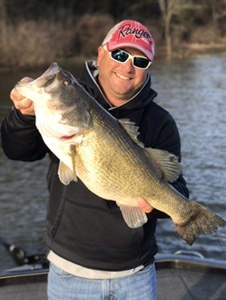 Not much has changed here on Lake Fork in the last month – the bite is still pretty darn good. Lake level is 398.52, or 4.48 ft below full pool, and water temps are sitting around 61-63 degrees. That will change with the big cold front that is coming in on Monday, so it will be interesting to see what that does to the bite next week. I’m not convinced that it will hurt the deep bite too much. I know there are some shallow fish that can be caught flipping jig to big timber around the creek channels, but I am spending all of my time fishing the deep fish. Luckily, I’ve been off on the days where the wind has blown 25-30 mph!!! I’m still throwing the same baits in (many of) the same places as last month. 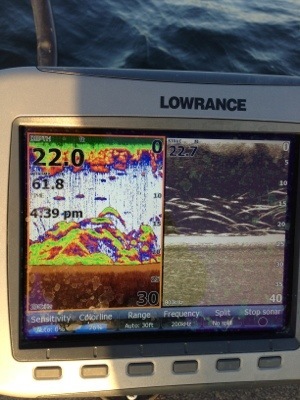 Points, road beds, deep channel swings, and humps are all holding fish. The road beds on the north end are in the 16-18 ft range, while the points on the south end will hold fish as deep as 30-31 ft. Use your electronics to cover water and look for the schools of fish. You will find the bass mixed in with the BIG white bass on many of these spots. Flutter spoons from Lake Fork Trophy Lures, jigging spoons, tail spinners, and a Santone Slamma rig (umbrella rig/Alabama rig) will all catch fish of all species. The Santone Slamma rig is my personal favorite. 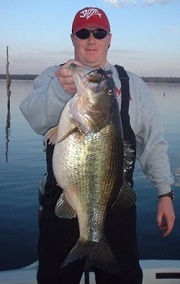 The strikes are vicious, and it’s not uncommon to catch more than one fish (bass and/or big white bass) at a time!!! 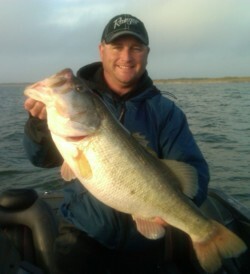 I still have some open dates this month if you’d like to come out to Lake Fork and get in on some of this action. 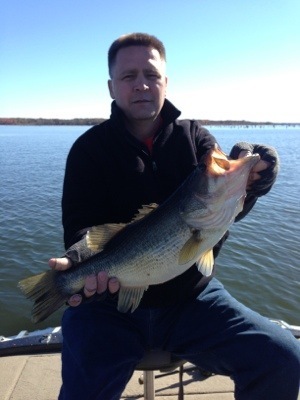 I also made a trip to Lake Welsh last week and we boated 34 largemouth bass in 4 hours of fishing. 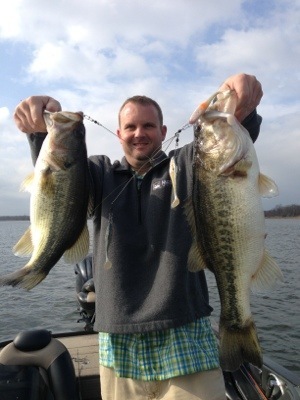 I run trips on Lake Welsh and Lake Monticello in the winter months, and it’s a lot of fun to catch these hard fighting power plant lake fish!!! After a nice start, we struggled for a bit to find some fish that would bite. We went to lunch with only 6 fish in the boat, and we only had 7 by 2:00 when I decided to move out to the main lake and fish for some staging fish. I could kick myself in the rear for not making the move a lot sooner. From 2:00 to 4:00, we boated 14 more and missed a couple more. 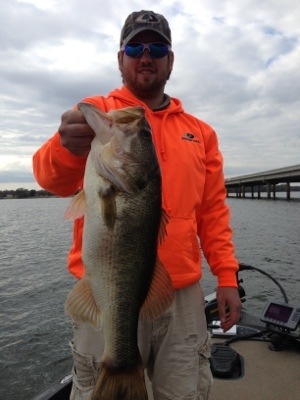 Shaky head LFT Zig Zag, Carolina rigged LFT Zig Zags, and drop shots all caught fish in the 5-10 ft range. All but a couple of these fish were prespawn females. It’s hard to leave the spawning pockets when you are seeing 63-70 degree water temps, but we just couldn’t get a consistent bite. Those fish will show up very soon, so keep your eyes open for cruisers. 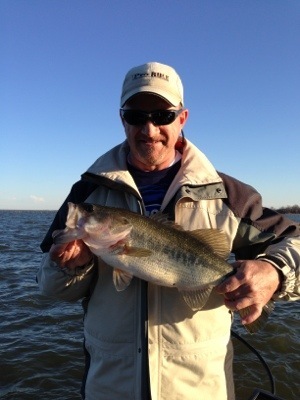 Great day on Lake Fork as we finished the day with 36 bass in the boat today. We had to hide from the wind a little bit, but it didnt take long to find a pattern. We fished soft plastics in 3-5 ft of water around the stumps. The key was to slow down and leave the bait by the wood as long as possible. The fish would just pick the bait up and hold it. 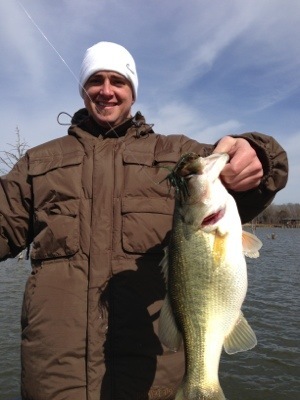 Water temp ranged from 58-61 degrees in the areas we fished. 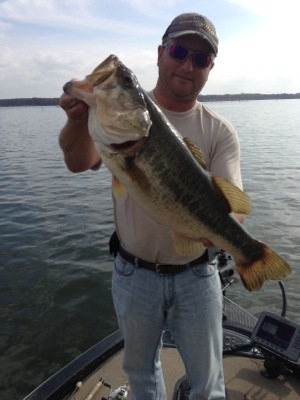 It’s a beautiful day on the lake today and the big girls are making there move. Light weight soft plastics are the deal so far this morning and we are starting to catch some bigger fish in shallow water. 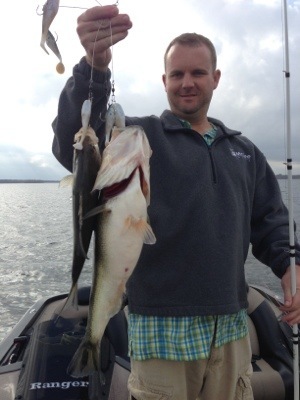 Water temp is 58 on the main lake and low to mid 60s in the creeks.